If you are like me, you missed PDC this year, and are probably pretty bummed about it. Fortunately you do get second chances sometimes! Microsoft is hosting a series of developer conferences around the country called the MSDN Developer Conference. This is a one day event that highlights the best of the PDC presentations, put on by a mix of Microsoft employees and community leaders in the area where the conference is held. I’ll be attending the Atlanta event on December 16 2008, but there are events in Houston, Orlando, Chicago, and other areas beginning in December and running into February of next year. Be sure to check the site for more info. There will be three tracks at the event, the new Azure Services Platform, Client and Presentation, and Tools Languages and Frameworks. There is a $99 attendance fee, but if you compare that to the cost of PDC that’s quite a bargain. There’s also going to be some cool swag, and attendance is limited so be sure to register today. It’s party time! The Birmingham Software Developers Association and the Birmingham .Net Users Group are joining forces to throw a holiday blast. The event will take place Tuesday, December 2nd 6:00 pm at Richard’s BBQ and Grill on Acton Road, just off Interstate 459. This is a family friendly event, spouses and children are encouraged to attend. We promise to keep the geek talk to a minimum. The clubs want to extend an invitation to all user groups in the Birmingham community. No matter what your group we’d like to extend a special invite to all to attend. Rumor has it there will be some swell door prizes and swag to give away. Please be aware the event is BYOW! Bring Your Own Wallet. Each family will be responsible for it’s own bill. Not to worry though, Richard’s rates are very reasonable, and they have a wide variety of food to pick from. In addition to BBQ they have a nice meat and three selection, and some of the best burgers you ever put in your mouth. Please RSVP to altechevents@gmail.com by close of business Monday, November 30th with how many will be attending so we can give the restaurant a semi-accurate count. Look forward to seeing you all then! On Monday November 10th, 2008 NASA lost contact with the Mars Phoenix Lander. As Mars enters it’s winter, sunlight faded to the point where the Phoenix lander was no longer able to recharge it’s batteries. The lander made many important discoveries, but frankly one of the things it did the most was to put a human face on space exploration via it’s frequent updates on Twitter. Of course, intellectually we know the real lander wasn’t doing the actual tweets. That credit goes to the amazing Veronica McGregor at JPL. But the twitter feed was managed in such a way that we could really feel like the real Phoenix lander itself was sending these messages. Over 38,000 people followed the lander, putting it among the true Twitter elite. Do you recall when we all first found out about ice on Mars? It wasn’t through a NASA press release, newspaper, or the evening news. No, the folks who first found out were the ones who followed the lander on a social networking site. How geekily cool is that? Wired magazine held a contest of sorts for appropriate epitaphs, and posted them on their site. The winner was veni, vidi, fodi (I came, I saw, I dug) but there were many many more well worth reading. Some were funny, some inspiring, and many emotionally touching. Gizmodo is carrying the final message from the Pheonix lander on it’s site. Very good, includes much information, including that while the lander could wake up when the winter season is over, that won’t be until our spring of 2010. After being encased in darkness and ice for that long, starting back up is highly unlikely. Still, the @MarsRovers were only supposed to last a few months, and they are still going after 5 years so anything is possible. Hope springs eternal. The level of communication brought about through sites, such as Twitter, means that anyone, from you or I to a probe on another planet can make their voice heard around the world. No, scratch that. Around the universe. My favorite epitaph was the following quote from James T. Kirk. 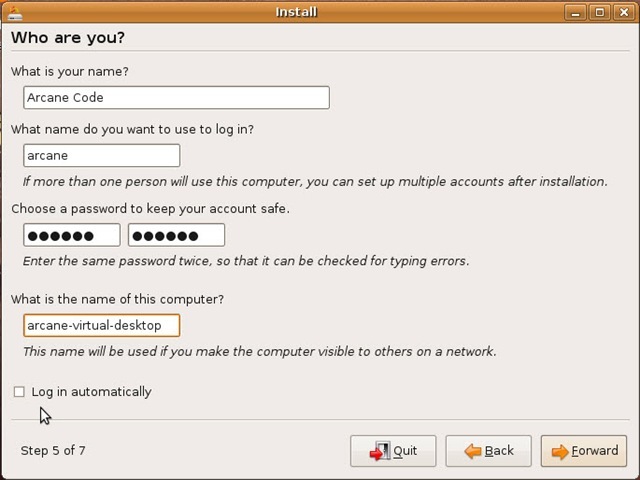 Installing Ubuntu 8.10 under Virtual PC 2007 is the easiest version to install by far, if you have all your bits in the right place. First, you’ll need Virtual PC 2007, available from the Microsoft site. 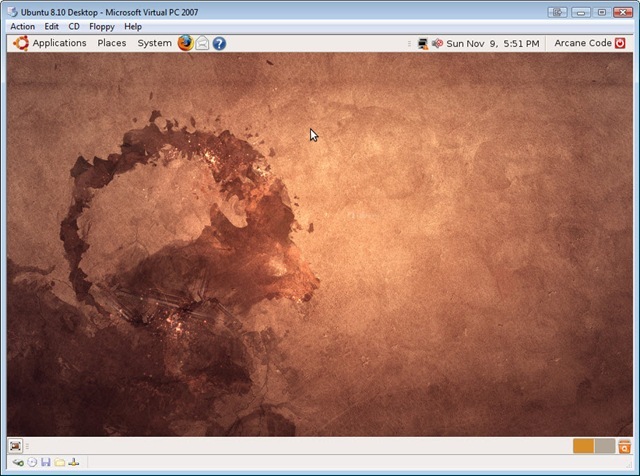 After you have installed VPC 2007, you will need to download and install Virtual PC 2007 Service Pack 1 (SP1). I had problems until I installed VPC SP1. Next you will need to setup a Virtual Machine to hold your Ubuntu. If you are not familiar with VPC, you can see either my step by step instructions or my instructional video. And finally you’ll of course need a copy of Ubuntu 8.10. You can either download an ISO from the Ubuntu website, which is what I did, or find it in some magazine. 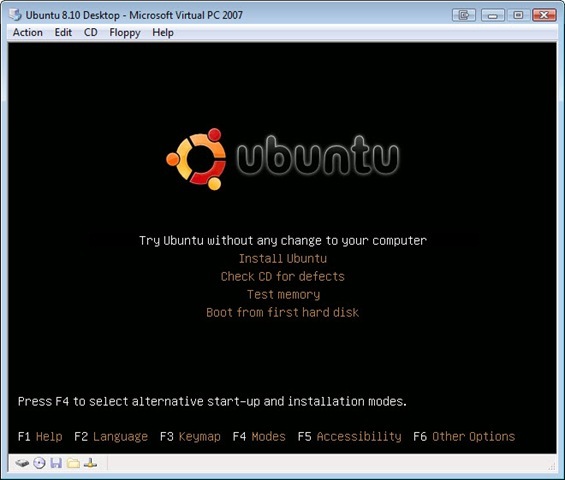 OK, just so we’re on the same page, I created my VPC and named it “Ubuntu 8.10 Desktop”. I used that name for both the vmc and vhd files. I selected “Other” for my OS, adjusted the ram to 512 MB. Finally, I left my hard disk at the default of 16384, Launch the VPC and point your virtual CD Drive at either the ISO or the drive where your Ubuntu disk is. Now you are at the default screen. Now you need to press F4, for Modes, and pick “Save graphics mode” and press Enter. If you want, you can explore the Ubuntu environment for a few minutes. One reminder / hint, when you click inside the virtual machine, your mouse becomes “trapped”. To be able to drag the mouse outside the window, press the RIGHT ALT key. (The left won’t work!) Your mouse will escape to freedom. Since my language is already selected, all I have to do is click Forward to go onto the next screen. On this screen, it asks me to pick a city near me so the time zone can be set. 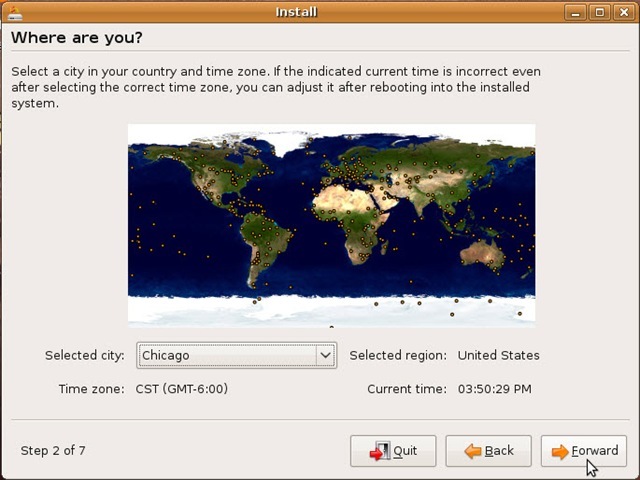 Chicago IL is in my time zone, so I’m going to pick it, you should of course pick one in your time zone. You can do so by clicking the map, but this is something of a pain, so I went with the faster route of picking my town from the drop down then clicking Forward. 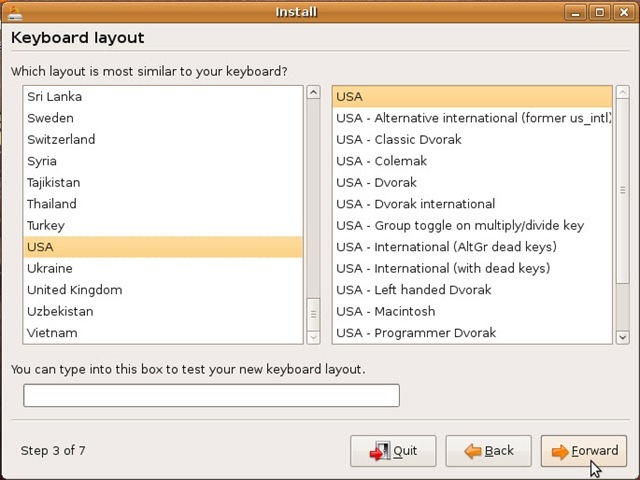 On the next screen we’re asked about keyboard layout. Select yours, or in my case it was already selected so all I had to do was hit Forward yet again. 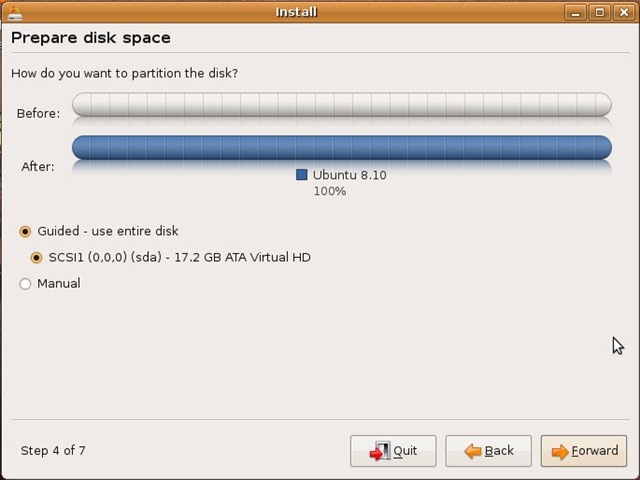 After hitting Forward, you’ll see a dialog appear briefly while Ubuntu looks at your disks while it determines the best way to partition them. Here we can adjust how to allocate disk space. Since this is all virtual, the simple thing to do is just accept the default and click Forward, which we will do. The disk will churn for a few minutes (in my case about 5) while it sets up the partition then present me with the next screen. You can see here it’s prompting me for information so it can setup my login name. Here I filled it out, and let it go with the default name to login with (my first name, arcane). I created a password, remember this as it’s also your admin password. Under name of the computer it defaults to your user name with a “-desktop” after it. I added the word virtual in the middle to make it clear. Also note the “Log in automatically” check box. If you are the only person using this VPC, and you don’t plan to store anything sensitive you may want to check this on, but if you are in doubt leave it unchecked to maintain the best security. For myself, I’ll leave this unchecked. OK, this last screen says we’re almost to the finish line. Just click “Install” to begin the install. This dialog will keep you updated as it goes through it’s install. 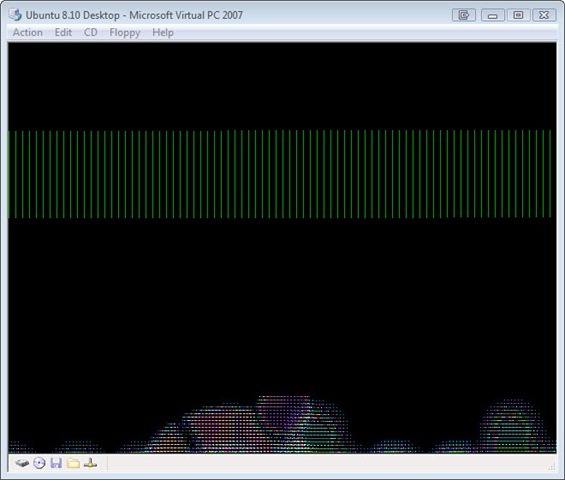 I did notice an odd quirk, when my mouse was escaped the install seemed to pause itself. If possible you may want to leave your focus inside the VPC. Don’t be alarmed if your screen goes black during the install. Just move your mouse around or hit some key. The blank screen is the Ubuntu screen saver kicking in! You’d think the installer would disable the screen saver, but it does not. I picked Restart Now. Only it didn’t, screen went blank after a few minutes and eventually everything just stopped. I wound up doing an Action, Reset from the VPC menu. After that the boot process for my VPC was quite similar to the test environment we just did. I saw the screen go blank for about a minute and a half, then the Ubuntu logo appeared. Another delay while it churned, showed me some garbled graphics, but finally (about 4 minutes total) it fired up and worked fine. I was able to enter my login info and away I went. I want to stress the key to success was, I believe, in having the latest Virtual PC service pack installed, attempts to load prior to updating with the service pack all failed due to graphics errors. The entire install process took about an hour and a half on my single core Vista computer with 2 gig of ram. I was creating the VPC on an external hard disk via firewire connection. Your install times will vary accordingly. PDC2008 – What’s in a name? As many of you know, the Microsoft PDC (Public Deveopers Conference) 2008 took place last week. Lots of new announcements, and in a class move Microsoft has made all of the sessions available for download from their site. However, navigating the site, as pretty as it is, and downloading all of the sessions can be a bit time consuming. One of my twitter friends, Luciano Guerche (@guercheLE ) has posted a series of blog posts for each day with quick hyperlinks to everything for faster download. He’s even done a post on how to bulk download using Firefox and DownThemAll. While this makes it much easer to download, my one complaint, regardless of where you download from, is knowing what you have. Microsoft simply named each file for it’s session number, leaving you with files such as PC47.wmv or BB08.wmv. Come on folks, what’s the point of having long file names if we’re not going to use them? So I wrote a series of batch files that will rename each file, adding the name of the session after the session number. This will make it much easier to determine what you have when browsing with explorer or when watching on your Zune. Simply copy the text below into your favorite text editor and save them as one or more .bat files. rename TL02.wmv "TL02 Under the Hood- Advances in the .NET Type System.wmv"
rename TL47.wmv "TL47 Microsoft Visual Studio Team System- A Lap Around VSTS 2010.wmv"
rename BB08.wmv "BB08 Microsoft Dynamics CRM- The Appealing Business Application.wmv"
rename TL29.wmv "TL29 Live Labs Web Sandbox- Securing Mash-ups, Site Extensibility, and Gadgets.wmv"
rename BB53.wmv "BB53 SharePoint Online- Extending Your Service.wmv"
rename BB48.wmv "BB48 Microsoft Advertising Platform- A Lap Around.wmv"
rename BB11.wmv "BB11 Identity Roadmap for Software plus Services.wmv"
rename PC12.wmv "PC12 Deep Dive- The New Rendering Engine in Microsoft Internet Explorer 8.wmv"
rename ES16.wmv "ES16 A Lap Around Windows Azure.wmv"
rename TL46.wmv "TL46 Microsoft Visual C Sharp IDE- Tips and Tricks.wmv"
rename BB58.wmv "BB58 Case Study- Bridging On-Premises with the Cloud.wmv"
rename ES30.wmv "ES30 Datacenters and Resilient Services.wmv"
rename PC47.wmv "PC47 Microsoft Expression Blend- Tips and Tricks.wmv"
rename BB56.wmv "BB56 Showcase- Industry Leaders Moving to the Cloud.wmv"
rename BB49.wmv "BB49 Microsoft Advertising Platform- A Day in the Life of a Click.wmv"
rename TL40.wmv "TL40 Dublin and .NET Services- Extending On-Premises Applications to the Cloud.wmv"
rename PC53.wmv "PC53 Building High Performance JScript Applications.wmv"
rename PC17.wmv "PC17 Developing for Microsoft Surface.wmv"
rename PC20.wmv "PC20 ASP.NET 4.0 Roadmap.wmv"
rename BB42.wmv "BB42 Identity- Geneva Server and Framework Overview.wmv"
rename BB09.wmv "BB09 Microsoft Office Communications Server and Exchange- Platform Futures.wmv"
rename TL33.wmv "TL33 Managed Extensibility Framework- Overview.wmv"
rename TL19.wmv "TL19 Microsoft Visual Studio- Bringing out the Best in Multicore Systems.wmv"
rename TL30.wmv "TL30 Microsoft Sync Framework Advances.wmv"
rename TL16.wmv "TL16 The Future of C Sharp.wmv"
rename TL52.wmv "TL52 Team Foundation Server 2010- Cool New Features.wmv"
rename PC21.wmv "PC21 ASP.NET MVC- A New Framework for Building Web Applications.wmv"
rename PC27.wmv "PC27 Microsoft Silverlight, WPF and the Microsoft .NET Framework- Sharing Skills and Code.wmv"
rename PC59.wmv "PC59 Commerce Server Mojave- Overview.wmv"
rename TL25.wmv "TL25 Parallel Programming for Cplusplus Developers in the Next Version of Microsoft Visual Studio.wmv"
rename TL10.wmv "TL10 Deep Dive- Dynamic Languages in Microsoft .NET.wmv"
rename TL03.wmv "TL03 Microsoft Visual Studio Team System- Software Diagnostics and Quality for Services.wmv"
rename BB29.wmv "BB29 Identity- Connecting Active Directory to Microsoft Services.wmv"
rename BB01.wmv "BB01 A Lap Around the Azure Services Platform.wmv"
rename TL17.wmv "TL17 WF 4.0- A First Look.wmv"
rename TL48.wmv "TL48 Microsoft Visual Studio- Web Development Futures.wmv"
rename PC58.wmv "PC58 Framework Design Guidelines.wmv"
rename BB45.wmv "BB45 Office Communications Server 2007 R2- Enabling Unified Communications.wmv"
rename TL13.wmv "TL13 Microsoft Visual Cplusplus- 10 Is the New 6.wmv"
rename BB15.wmv "BB15 SQL Server- Database to Data Platform - Road from Server to Devices to the Cloud.wmv"
rename TL49.wmv "TL49 Microsoft .NET Framework- Overview and Applications for Babies.wmv"
rename TL45.wmv "TL45 Microsoft Visual Studio Team System Database Edition- Overview.wmv"
rename TL09.wmv "TL09 Agile Development with Microsoft Visual Studio.wmv"
rename ES32.wmv "ES32 Microsoft Application Virtualization 4.5.wmv"
rename TL44.wmv "TL44 IronRuby- The Right Language for the Right Job.wmv"
rename ES01.wmv "ES01 Developing and Deploying Your First Windows Azure Service.wmv"
rename BB36.wmv "BB36 FAST- Building Search-Driven Portals with Microsoft Office SharePoint Server 2007 and Microsoft Silverlight.wmv"
rename TL39.wmv "TL39 Coding4Fun- Windows Presentation Foundation Animation, YouTube, iTunes, Twitter, and Nintendo's Wiimote.wmv"
rename TL54.wmv "TL54 Natural Interop with Silverlight, Office, and Python in Microsoft Visual C Sharp and Microsoft Visual Basic.wmv"
rename BB57.wmv "BB57 Microsoft Dynamics AX- Building Business Process into Your Application.wmv"
rename ES29.wmv "ES29 Showcase- Windows Azure Enables - Nsoftware and Full Armor.wmv"
rename PC44.wmv "PC44 Windows 7- Programming Sync Providers That Work Great with Windows.wmv"
rename TL59.wmv "TL59 Visual Studio Debugger Tips and Tricks.wmv"
rename BB52.wmv "BB52 SQL Services- Tips and Tricks for High-Throughput Data-Driven Applications.wmv"
rename BB41.wmv "BB41 Live Services- What I Learned Building My First Mesh Application.wmv"
rename TL38.wmv "TL38 WCF- Zen of Performance and Scale.wmv"
rename PC24.wmv "PC24 Windows 7- Welcome to the Windows 7 Desktop.wmv"
rename TL07.wmv "TL07 Developing Applications Using Data Services.wmv"
rename BB04.wmv "BB04 Live Services- A Lap around the Live Framework and Mesh Services.wmv"
rename TL14.wmv "TL14 Project Velocity- A First Look.wmv"
rename BB16.wmv "BB16 SQL Server 2008- Beyond Relational.wmv"
rename ES13.wmv "ES13 How to Develop Supercomputer Applications.wmv"
rename TL55.wmv "TL55 The Concurrency and Coordination Runtime and Decentralized Software Services Toolkit.wmv"
rename PC52.wmv "PC52 Windows 7- Writing World-Ready Applications.wmv"
rename BB07.wmv "BB07 SQL Server 2008- Developing Large Scale Web Applications and Services.wmv"
rename PC51.wmv "PC51 Windows 7- Best Practices for Developing for Windows Standard User.wmv"
rename ES04.wmv "ES04 Windows Azure- Essential Cloud Storage Services.wmv"
rename BB26.wmv "BB26 SQL Server 2008- Business Intelligence and Data Visualization.wmv"
rename PC46.wmv "PC46 WPF Roadmap.wmv"
rename TL23.wmv "TL23 A Lap around Oslo.wmv"
rename TL27.wmv "TL27 Oslo- The Language.wmv"
rename PC11.wmv "PC11 Microsoft Silverlight Futures- Building Business Focused Applications.wmv"
rename TL56.wmv "TL56 Project Velocity- Under the Hood.wmv"
rename PC50.wmv "PC50 Windows 7- Using Instrumentation and Diagnostics to Develop High Quality Software.wmv"
rename PC33.wmv "PC33 Microsoft Visual Studio- Easing ASP.NET Web Deployment.wmv"
rename PC10.wmv "PC10 Microsoft Silverlight 2 for Mobile- Developing for Mobile Devices.wmv"
rename BB43.wmv "BB43 Identity- Geneva Deep Dive.wmv"
rename BB20.wmv "BB20 Live Services- Making your Application More Social.wmv"
rename BB23.wmv "BB23 A Lap around SQL Services.wmv"
rename PC23.wmv "PC23 Windows 7- Integrate with the Windows 7 Desktop.wmv"
rename BB02.wmv "BB02 Architecture of the .NET Services.wmv"
rename TL20.wmv "TL20 Entity Framework Futures.wmv"
rename PC06.wmv "PC06 Deep Dive- Building an Optimized, Graphics-Intensive Application in Microsoft Silverlight.wmv"
rename ES10.wmv "ES10 Developing Solutions for Windows Server 2008 Hyper-V Using WMI.wmv"
rename PC31.wmv "PC31 ASP.NET and JQuery.wmv"
rename BB22.wmv "BB22 Identity- Live Identity Services Drilldown.wmv"
rename TL12.wmv "TL12 Future Directions for Microsoft Visual Basic.wmv"
rename BB40.wmv "BB40 Sync Framework- Enterprise Data in the Cloud and on Devices.wmv"
rename PC04.wmv "PC04 Windows 7- Writing Your Application to Shine on Modern Graphics Hardware.wmv"
rename ES11.wmv "ES11 Developing Connected Home Applications and Services for Windows Home Server.wmv"
rename TL50.wmv "TL50 Research- BAM, AjaxScope, and Doloto.wmv"
rename BB05.wmv "BB05 Live Services- Building Applications with the Live Framework.wmv"
rename ES20.wmv "ES20 Developing Applications for More Than 64 Logical Processors in Windows Server 2008 R2.wmv"
rename PC16.wmv "PC16 Windows 7- Empower users to find, visualize and organize their data with Libraries and the Explorer.wmv"
rename ES02.wmv "ES02 Windows Azure- Architecting and Managing Cloud Services.wmv"
rename TL06.wmv "TL06 WCF 4.0- Building WCF Services with WF in Microsoft .NET 4.0.wmv"
rename BB19.wmv "BB19 Live Services- Live Framework Programming Model Architecture and Insights.wmv"
rename TL57.wmv "TL57 Panel- The Future of Programming Languages.wmv"
rename BB38.wmv "BB38 .NET Services- Connectivity, Messaging, Events, and Discovery with the Service Bus.wmv"
rename ES14.wmv "ES14 IIS 7.0 and Beyond- The Microsoft Web Platform Roadmap.wmv"
rename BB14.wmv "BB14 SQL Services- Futures.wmv"
rename ES12.wmv "ES12 Exposing Connected Home Services to the Internet via Windows Home Server.wmv"
rename ES31.wmv "ES31 Showcase- How HP Built their Magcloud Service on Windows Azure.wmv"
rename TL58.wmv "TL58 Research- Concurrency Analysis Platform and Tools for Finding Concurrency Bugs.wmv"
rename PC27.wmv "PC27-R Microsoft Silverlight, WPF and the Microsoft .NET Framework- Sharing Skills and Code [REPEAT].wmv"
rename PC25.wmv "PC25 Windows 7- The Sensor and Location Platform- Building Context-Aware Applications.wmv"
rename TL26.wmv "TL26 Parallel Programming for Managed Developers with the Next Version of Microsoft Visual Studio.wmv"
rename TL42.wmv "TL42 Microsoft SQL Server 2008- Powering MSDN.wmv"
rename PC48.wmv "PC48 Research- Designing the World Wide Telescope.wmv"
rename PC35.wmv "PC35 Silverlight Controls Roadmap.wmv"
rename TL61.wmv "TL61 Panel- The Future of Unit Testing.wmv"
rename ES25.wmv "ES25 Showcase- Windows Azure Enables Live Meeting.wmv"
rename TL37.wmv "TL37 Microsoft Visual Studio Team System- Leveraging Virtualization to Improve Code Quality with Team Lab.wmv"
rename TL60.wmv "TL60 Improving Code Quality with Code Analysis.wmv"
rename TL43.wmv "TL43 Microsoft XNA Game Studio- An Overview.wmv"
rename TL46-R.wmv "TL46-R Microsoft Visual C Sharp IDE- Tips and Tricks [REPEAT].wmv"
rename BB37.wmv "BB37 SQL Server 2008- Developing Secure Applications.wmv"
rename BB59.wmv "BB59 Behind the Scenes- How We Built a Multi-Enterprise Supply Chain Application.wmv"
rename PC22.wmv "PC22 Windows 7- Design Principles for Windows 7.wmv"
rename TL18.wmv "TL18 Oslo- Customizing and Extending the Visual Design Experience.wmv"
rename TL24.wmv "TL24 Improving .NET Application Performance and Scalability.wmv"
rename ES07.wmv "ES07 Windows Azure- Modeling Data for Efficient Access at Scale.wmv"
rename ES22.wmv "ES22 Extending Terminal Services and Hyper-V VDI in Windows 7.wmv"
rename PC18.wmv "PC18 Windows 7- Introducing Direct2D and DirectWrite.wmv"
rename TL22.wmv "TL22 Concurrency Runtime Deep Dive- How to Harvest Multicore Computing Resources.wmv"
rename PC39.wmv "PC39 Inside the Olympics- An Architecture and Development Review.wmv"
rename BB51.wmv "BB51 Live Services- Programming Live Services Using Non-Microsoft Technologies.wmv"
rename PC03.wmv "PC03 Windows 7- Developing Multi-touch Applications.wmv"
rename BB25.wmv "BB25 SQL Server 2008- New and Future T-SQL Programmability.wmv"
rename BB39.wmv "BB39 .NET Services- Logging, Diagnosing, and Troubleshooting Applications Running Live in the Cloud.wmv"
rename TL28.wmv "TL28 Oslo- Repository and Models.wmv"
rename BB06.wmv "BB06 Live Services- Mesh Services Architecture and Concepts.wmv"
rename PC40.wmv "PC40 SQL Server Compact- Embedding in Desktop and Device Applications.wmv"
rename BB18.wmv "BB18 Dublin- Hosting and Managing Workflows and Services in Windows Application Server.wmv"
rename BB24.wmv "BB24 SQL Server 2008- Deep Dive into Spatial Data.wmv"
rename PC43.wmv "PC43 Deep Dive- What's New with user32 and comctl32 in Win32.wmv"
rename TL08.wmv "TL08 Offline-Enabled Data Services and Desktop Applications.wmv"
rename BB55.wmv "BB55 .NET Services- Access Control In Microsoft .NET Services.wmv"
rename ES23.wmv "ES23 Windows 7- Optimizing Applications for Remote File Services over the WAN.wmv"
rename PC30.wmv "PC30 ASP.NET Dynamic Data.wmv"
rename PC55.wmv "PC55 Oomph- A Microformat Toolkit.wmv"
rename TL16.wmv "TL16-R The Future of C Sharp [REPEAT].wmv"
rename ES06.wmv "ES06 Developing with Microsoft .NET and ASP.NET for Server Core.wmv"
rename ES03.wmv "ES03 Windows Azure- Cloud Service Development Best Practices.wmv"
rename PC14.wmv "PC14 Windows 7- New Shell User Experience APIs.wmv"
rename BB30.wmv "BB30 Live Services- Building Mesh-Enabled Web Applications Using the Live Framework.wmv"
rename TL15.wmv "TL15 Architecture without Big Design Up Front.wmv"
rename BB32.wmv "BB32 Microsoft Dynamics CRM- Building Line-of-Business Applications.wmv"
rename ES15.wmv "ES15 Web Application Packaging and Deployment.wmv"
rename TL21.wmv "TL21 WF 4.0- Extending with Custom Activities.wmv"
rename TL33.wmv "TL33-R Managed Extensibility Framework- Overview [REPEAT].wmv"
rename PC56.wmv "PC56 Windows Embedded Quebec- Developing for Devices.wmv"
rename TL23.wmv "TL23-R A Lap around Oslo [REPEAT].wmv"
rename BB28.wmv "BB28 .NET Services- Access Control Service Drilldown.wmv"
rename PC54.wmv "PC54 Mono and .NET.wmv"
rename TL04.wmv "TL04 Microsoft Visual Studio Team System Team Foundation Server- How We Use It at Microsoft.wmv"
rename BB31.wmv "BB31 Live Services- FeedSync and Mesh Synchronization Services.wmv"
rename BB09-R.wmv "BB09-R Microsoft Office Communications Server and Exchange- Platform Futures [REPEAT].wmv"
rename TL51.wmv "TL51 Research- Contract Checking and Automated Test Generation with Pex.wmv"
rename BB03.wmv "BB03 SQL Services - Under the Hood.wmv"
rename ES24.wmv "ES24 PowerShell- Creating Manageable Web Services.wmv"
rename PC02.wmv "PC02 Windows 7- Extending Battery Life with Energy Efficient Applications.wmv"
rename BB46.wmv "BB46 Exchange Web Services Managed API- Unified Communications Development for Exchange.wmv"
rename BB33.wmv "BB33 Dynamics Online- Building Business Applications with Commerce and Payment APIs.wmv"
rename BB13.wmv "BB13 SharePoint 2007- Creating SharePoint Applications with Visual Studio 2008.wmv"
rename PC01.wmv "PC01 Windows 7- Web Services in Native Code.wmv"
rename TL35.wmv "TL35 WCF- Developing RESTful Services.wmv"
rename SYMP01.wmv "SYMP01 Parallel Symposium- Addressing the Hard Problems with Concurrency.wmv"
rename SYMP04.wmv "SYMP04 Services Symposium- Expanding Applications to the Cloud.wmv"
rename TL36.wmv "TL36 Microsoft .NET Framework- Declarative Programming Using XAML.wmv"
rename ES19.wmv "ES19 Under the Hood- Inside the Windows Azure Hosting Environment.wmv"
rename PC49.wmv "PC49 Microsoft .NET Framework- CLR Futures.wmv"
rename PC34.wmv "PC34 Open XML Format SDK- Developing Open XML Solutions.wmv"
rename PC41.wmv "PC41 ASP.NET- Cache Extensibility.wmv"
rename TL32.wmv "TL32 Microsoft Visual Studio- Customizing and Extending the Development Environment.wmv"
rename PC42.wmv "PC42 Windows 7- Deploying Your Application with Windows Installer (MSI) and ClickOnce.wmv"
rename BB12.wmv "BB12 .NET Services- Messaging Services - Protocols, Protection, and How We Scale.wmv"
rename ES21.wmv "ES21 Windows 7 Presentation Virtualization- Graphics Remoting ( RDP) Today and Tomorrow.wmv"
rename BB35.wmv "BB35 Live Services- The Future of the Device Mesh.wmv"
rename PC26.wmv "PC26 Microsoft Visual Studio- Building Applications with MFC.wmv"
rename SYMP02.wmv "SYMP02 Parallel Symposium- Application Opportunities and Architectures.wmv"
rename SYMP05.wmv "SYMP05 Services Symposium- Enterprise Grade Cloud Applications.wmv"
rename PC29.wmv "PC29 Microsoft Silverlight 2- Control Model.wmv"
rename PC13.wmv "PC13 Windows 7- Building Great Audio Communications Applications.wmv"
rename BB34.wmv "BB34 Live Services- Notifications, Awareness, and Communications.wmv"
rename ES09.wmv "ES09 Enabling Test Automation Using Windows Server 2008 Hyper-V.wmv"
rename BB47.wmv "BB47 SharePoint 2007- Advanced Asynchronous Workflow Messaging.wmv"
rename TL34.wmv "TL34 Managed and Native Code Interoperability- Best Practices.wmv"
rename PC45.wmv "PC45 WPF- Data-centric Applications Using the DataGrid and Ribbon Controls.wmv"
rename PC05.wmv "PC05 Windows 7- Unlocking the GPU with Direct3D.wmv"
rename TL01.wmv "TL01 Office Business Applications- Enhanced Deployment.wmv"
rename BB54.wmv "BB54 Designing Your Application to Scale.wmv"
rename TL31.wmv "TL31 Oslo- Building Textual DSLs.wmv"
rename SYMP03.wmv "SYMP03 Parallel Symposium- Future of Parallel Computing.wmv"
rename SYMP06.wmv "SYMP06 Services Symposium- Cloud or No Cloud, the Laws of Physics Still Apply.wmv"
rename ES17.wmv "ES17 Windows Azure- Programming in the Cloud.wmv"
rename BB27.wmv "BB27 .NET Services- Orchestrating Services and Business Processes Using Cloud-Based Workflow.wmv"
rename PC07.wmv "PC07 WPF- Extensible BitmapEffects, Pixel Shaders, and WPF Graphics Futures.wmv"
rename BB10.wmv "BB10 Live Services- Deep Dive on Microsoft Virtual Earth.wmv"
rename PC19.wmv "PC19 Windows 7- Designing Efficient Background Processes.wmv"
rename BB44.wmv "BB44 Identity- Windows CardSpace Geneva Under the Hood.wmv"
rename PC15.wmv "PC15 Windows 7- Benefiting from Documents and Printing Convergence.wmv"
rename TL11.wmv "TL11 An Introduction to Microsoft F Sharp.wmv"
rename PC32.wmv "PC32 ASP.NET AJAX Futures.wmv"
Update – After I wrote this, I found @Jorriss (another twitter friend) post which essentially does the same thing as what I do above, only he uses some cool C# and reading the sessions names from the web, rather than the simple batch file approach I took above. Read his post then choose which solution best fits your needs.